So, I have a question to some folks about buying and returning toys. I'll use the animated shockwave bumble target exclusive, two pack as an example. Suppose you bought both shockwaves, opened both and took the purple one and kept it, and put the black one back in the wrong box, the one with bumblebee and returned it. I know someone in my area has done this and it was really kind of a gasp and took me back. I wonder how common this practice is. I didn't point it out to the store, cause, well, I work in retail, I know nothing much would be done other than hope the item sells. Re: Have you ever returned a toy in the wrong box? I've seen a similar situation with the ROTF leader class Optimus Prime replaced with '07 Movie Prime on another board a while back and I was suprised to find out that it actually DID sell. Stores really need to watch what they rake in from the returns department as I've seen an Armada Hotshot returned in a Universe Hotshot box, a knock-off G1 Onslaught and other knock-off Bruticus limbs returned in the RID Walmart Exclusive Ruination box, and, believe it or not, a legends class animated Thundercracker returned in a animated voyager Skywarp's packaging! Thats just pitiful! My opinion on the matter is that, while I'm sure that us members of the board won't be fooled by this trickery, millions of less familar children and parents will be. Armada Giga-Con Jetfire, with the packaging including nothing but the chest plate. One half of a broken up Robots in Disguise Ultra Magnus in a much smaller box that belonged to a toy from a later line. 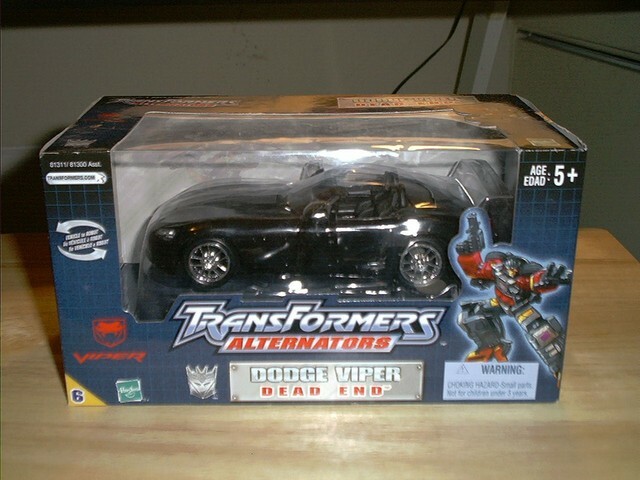 Alternators Dead End, with the packaging containing a non-transforming black Dodge Viper convertible model car. This was actually sold on eBay as a "rare factory error variant" of Alternators Side Swipe. A painted piece of wood (!) 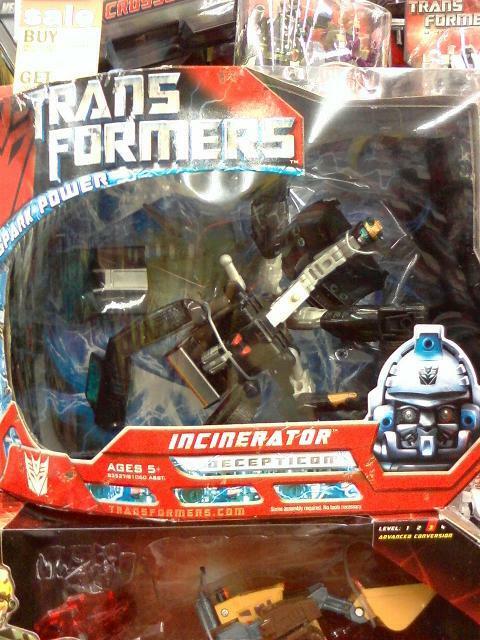 in a Transformers packaging. Cybertron Leader Class Optimus Prime, with the packaging containing a bootleg of the Power Rangers figure Ninjor. Movie Voyager Ratchet and Movie Voyager Ironhide, with the packaging containing either Cybertron Deluxe Demolishor or Cybertron Voyager Mudflap. A pair of binoculars (!) in Transformers packaging. Energon Megatron in an Energon Galvatron box. A terribly broken Titanium Thundercracker in a Movie Thundercracker box. The original release of Voyager Class Ironhide from the 2007 Movie toyline in the packaging of the "Premium Series" redeco. 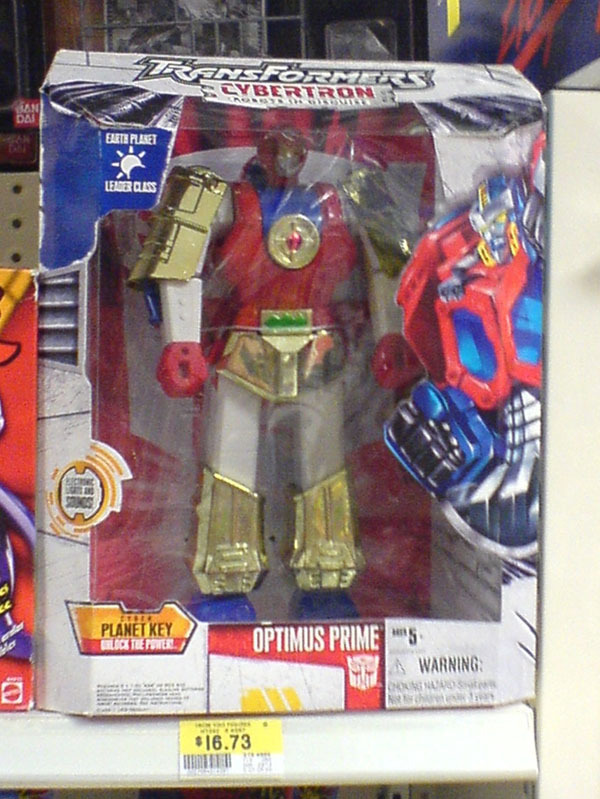 A Power Rangers Ninjor/Ninjakon knockoff in Cybertron Optimus Prime packaging. "Details and colors may vary." The infamous non-transforming black Dodge Viper in an Alternators Dead End packaging. "Rare factory error variant! Could be yours for only $1000!" This is just pathetic. Notice that both boxes in the pic have the wrong toy in them. And need I really comment on this one? Thats just horrible. A piece of wood?!?!? HA! Thats sickening! Btw, any proud owners of that Universe Razorclaw willing to part with theirs? I'd gladly take it off your hands! The way most retail stores work, the people that do the returns dont stock the area, and toys change every 3-4 months in some cases, so, if you're not a collector, how can you keep up anyway? that is really pathetic of those people. lordmegatron have you ran in to this before, i personally cant say i have, but like you said the collectors like ourselves wont have this problem, but young children and older adults wont know the difference . just the other day i was on the hunt for a devastsor set at tru and two women asked me witch of the transformers were from the movie, i even helped them pick the ones that were for the right ages. i think they were more look at the price tag than anything else. in the mean time lets just make a pact that if we see packages that have been tampered with let someone in the toy depot know. if i saw someone returning something like that i would find the store manager and them know whats going on, being discreet as well. thats a crime called stealing. First Gen at Seibertron.com wrote: Shopping my local Walmart recently, I was doing my normal rounds for Transformers sightings when I found all the newly released Transformers Revenge of the Fallen toys in all their glory. As I gazed at all the figures and admired the alt modes for them I looked at the lone two leader class figures they had, Optimus Prime and Megatron. Now of all the ROTF figures, Optimus was one I definately wanted to see in hand but when I grabbed him I was met with an unpleasant surprise. Yes, it was the 2007 figure release in ROTF packaging. Megatron was also the 2007 regular figure, before Premium that is, in the ROTF packaging. Upon closer investigation it turned out that it was a returned item. Whoever returned it took the time to not only completey retape the package over the old tape, but the twisty tied the figures back also. I brought this to the attention of Walmart customer service to which they just had to take the figures out of stock, but given the figures are very close in size to the last films release, this may not be an isolated incident. I had to literally point out all the differences of the figures to the customer service associates because they couldn't tell the difference between them. I believe this is what you were referring to, Lord Megs. YES. I completely forgot that he said that they had done the same thing to ROTF Megatron! You're just trying to make me mad aren't you? If these people had any brians, they wloud be smart enough to either sell the old toy on a garage sale or take it to a second hand store so underprivlaged children could have an (for sake of argument) Optimus Prime figure.